In terms of Section 35 of the Monetary Law Act No. 58 of 1949, the sixty eighth Annual Report of the Monetary Board of the Central Bank of Sri Lanka was presented to Hon. 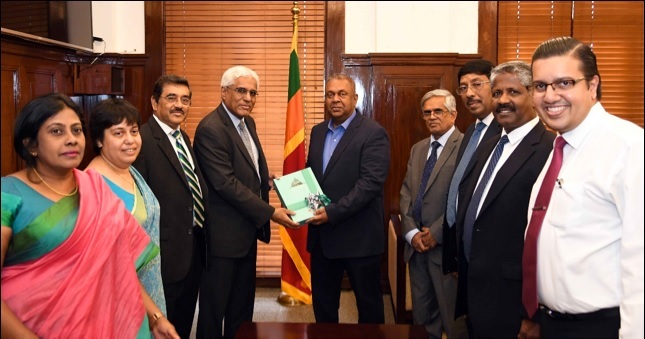 Mangala Samaraweera, the Minister of Finance and Mass Media, by Dr. Indrajit Coomaraswamy, the Governor of the Central Bank of Sri Lanka. The stabilisation policy measures taken by the Central Bank and the government in the past two years resulted in a number of notable improvements, although real economic growth faltered and recorded a multi year low during 2017. The monetary policy stance of the Central Bank that was gradually tightened since end 2015, was tightened further in March 2017 by raising the key policy interest rates of the Central Bank by 25 basis points. Increasing market interest rates were allowed to stabilise at high levels. Nevertheless, the improvements in relation to the government securities market, which corrected some distortions that prevailed in 2015 and 2016, resulted in a significant decline in yields on government securities, thus exerting a downward effect on some market interest rates towards the end of the year. The high nominal and real interest rates, together with supportive macroprudential measures, prompted a gradual deceleration in the growth of monetary aggregates in 2017. This deceleration was effected via more active open market operations (OMOs) through which the Central Bank maintained appropriate levels of liquidity in the domestic money market by reducing the Central Bank holdings of government securities substantially in order to offset the impact of the rapid buildup of net foreign assets (NFA) of the banking system due to net purchases of foreign exchange inflows by the Central Bank. While active OMOs helped the Central Bank to maintain short term interest rates, particularly the interbank call market rate, at desirable levels, the enhanced monetary policy communication strategy helped anchor inflation expectations, despite higher than expected headline inflation driven by supply side disturbances.